Release 0.22 of Articles sees some new features, and a number of improvements - mostly to the admin side. If you are upgrading from an earlier version, you will need to run an update script after you have updated the module. Please read "docs/UPDATE.txt" in the archive for more info. Please also note that previous language files are no longer compatible with this version! The admin area has been (mostly) recoded, with a navigation and info bar at the top to aid with easy navigation. Added support for 3rd party WYSIWYG editors such as SPAW. Added previews for new articles and categories. Users can now submit articles. Perhaps the first thing you will notice in this release, is the navigation and info bar at the top of admin pages. This is to aid in easy navigation of the admin area. The article addition/edit page has now been split into separate areas - some people found the combined page difficult to add new articles if you had a long list already added. The "edit" and "delete" captions in article and category listings have been changed in favour of icons, this gives more room for other columns and info. There is also a "status" icon, which shows whether an article is currently published or hidden. I have also recoded a lot of the admin area, removing some unnecessary code and cleaning up some other - this (and the navigation bar) came about after investigating support for 3rd party editors, which required much recoding anyway. The category description now has the same display options as the article text. There is now support for SPAW, FCK Editor and HTML Area WYSIWYG editors, if any are selected in the preferences, and installed, Articles will use these. If not, Articles will use the default editor. 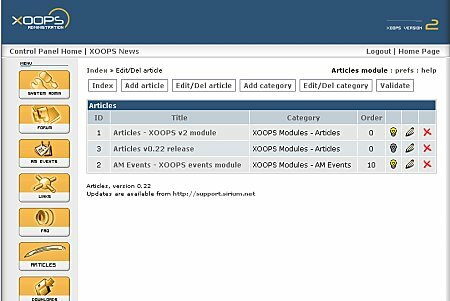 The preferences has now been integrated into XOOPS. When I first started with Articles, I didn't know how to do this, so ended up creating my own prefs area. This has proven relatively hard work when adding new features that require user prefs. Moving away from this will allow me to add new features, and preferences with more ease than before. Users can now submit articles. The submission page also supports 3rd party WYSIWYG editors, which can be defined in the prefs. Submitted articles will have to be validated by an admin before it is published. There are now two new notifications, one for categories and one for admin to be notified on a submitted article. The latest version of Articles can be downloaded from the download area.